Reliability, as previously defined, is the probability a component or system will perform as designed. Like all probability values, reliability is expressed a number ranging between 0 and 1, inclusive. A reliability value of zero (0) means the component or system is totally unreliable (i.e. it is guaranteed to fail). Conversely, a reliability value of one (1) means the component or system is completely reliable (i.e. guaranteed to properly function). In the context of dependability (i.e. 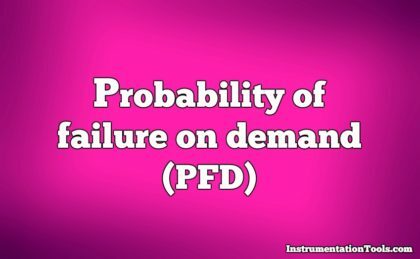 the probability that a safety component or system will function when called upon to act), the unreliability of that component or system is referred to as PFD, an acronym standing for Probability of Failure on Demand. Like dependability, this is also a probability value ranging from 0 to 1, inclusive. A PFD value of zero (0) means there is no probability of failure (i.e. it is 100% dependable – guaranteed to properly perform when needed), while a PFD value of one (1) means it is completely undependable (i.e. guaranteed to fail when activated). Obviously, a system designed for high dependability should exhibit a small PFD value (very nearly 0). Just how low the PFD needs to be is a function of how critical the component or system is to the fulfillment of our human needs. The degree to which a system must be dependable in order to fulfill our modern expectations is often surprisingly high. Suppose someone were to tell you the reliability of seat-belts in a particular automobile was 99.9 percent (0.999). Let’s suppose an automobile manufacturer sets a goal of only 1 failed seatbelt in any of its cars during a 1 million unit production run, assuming each and every one of these cars were to crash. Thus, the dependability of these seatbelts must be 99.999975% in order to fulfill the goal of only 1 (potential) seatbelt failure out of 4 million seatbelts produced. Expressed thusly, the seatbelt dependability must be “six nine’s” in order to achieve the automobile manufacturer’s goal. What is intrinsic safety ?